Heidi Klum's 11th Annual Halloween Party At Lavo! I love that Heidi Klum and her Husband Seal always go all out for their annual Halloween party! The power couple decided to have their 11th annual Halloween Bash at current NYC hot spot Lavo. Let's check out who stopped by and who the came dressed as! Above: Kim Kardashian showed up as Little Red Hiding Hood. I think that this costume is a little too safe for Heidi and Seal's party! You have to go big or go home! Above: Who is that crazy french maid?! Why it is the fab designer Chrisitian Siriano! Above: Designer Rebecca Minkoff showed up as one of my faves, Frida Khalo. Looks like the designer was afraid to commit to the full on unibrow. It's OK Becca, I understand! Above: I never know how to feel about this costume when I see people do it. The former Mr. Marc Jacobs, Lorenzo Martone, dressed as Jesus. I have a feeling no matter what he decided to be it was going to be shirtless. Other celebs that did not attend the Klum/Seal bash had some interesting costumes this year. Above: Meredith Vieira let out her inner monster as Lady Gaga complete with backup dancers on NBC's Today. Above: Speaking of Gaga, the pop superstar dressed up as a bloody, pistol packing Cruella De Ville with bloody dalmations in tow. 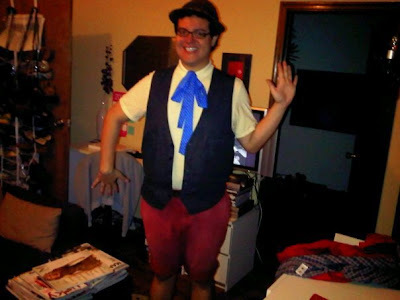 Above: OJ&B's Jonathan Valdez as Pinocchio. I used my own clothes for this costume! I hope everyone had a fun and safe Halloween! Maybe next year OJ&B will have a bash!